New York, NY- The Cutting Room, located at 44 E. 32nd Street, NYC, proudly presents Shunzo Ohno on Saturday, December 19, at 7:30 PM. Doors open at 6:30 PM. 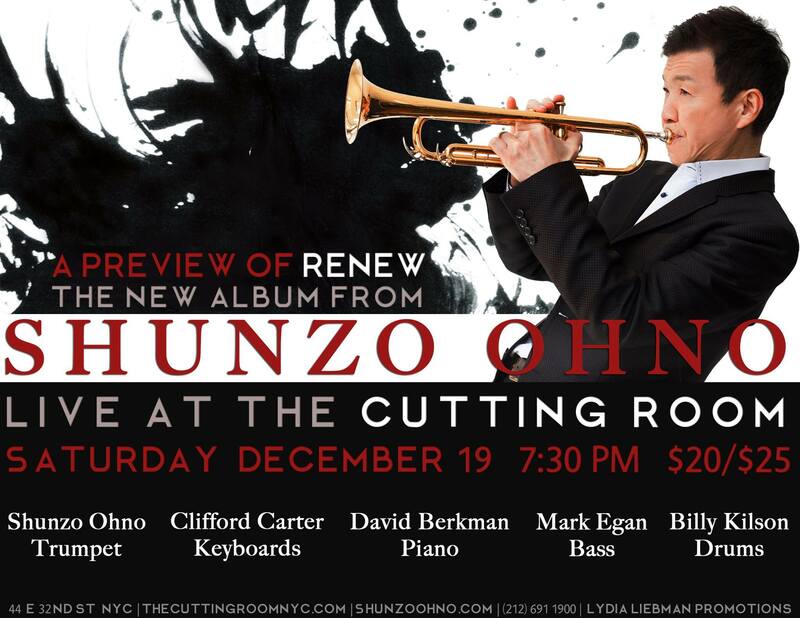 Tickets, which are $20 in advance and $25 day of the show, can be purchased online by visiting http://tickets.thecuttingroomnyc.com/event/990549-shunzo-ohno-new-york/or by calling 212 691 1900. Joining Shunzo will be a powerhouse rhythm section featuring Clifford Carter on keyboards, David Berkman on piano, Mark Egan on bass and drummer Billy Kilson. Each musician brings his own unique voice to Ohno’s dynamic, genre-bending that shares elements of the traditional jazz language, free jazz, and heart-felt melodies. Shunzo Ohno is considered one of the most versatile and influential trumpeters of modern jazz. Born in Gifu Prefecture, Japan, Shunzo’s rise to prominence began in 1974, when he accepted an offer to perform with the legendary jazz drummer Art Blakey. Following his tenure with Blakey, Shunzo propelled with a series of important collaborations, including ones with Machito and his Afro-Cuban Orchestra, Wayne Shorter, Larry Coryell, Herbie Hancock, and Gil Evans, who was a long-time collaborator of Shunzo’s. Shunzo has recorded 16 albums as a leader and has been featured on two Grammy winning recordings. Shunzo’s life encountered much adversity, including a serious automobile accident and the diagnosis of stage 4 throat cancer. Through both of these life-changing events, Shunzo creates inspiration to not only overcome these challenges, but redevelop his unique sound and musical voice, admired by a global community. In 2014, Shunzo won the International Songwriting Competition’s grand prize with his composition “Musashi”, making Shunzo the first jazz recipient of this prestigious award. In recent years, Shunzo has been touring the globe, performing frequently in Hong Kong, Malaysia, China, Singapore, Taiwan, Japan and various US cities. Shunzo’s tours are concurrently supporting the recovery efforts following the natural disasters in Japan and recently, Nepal.